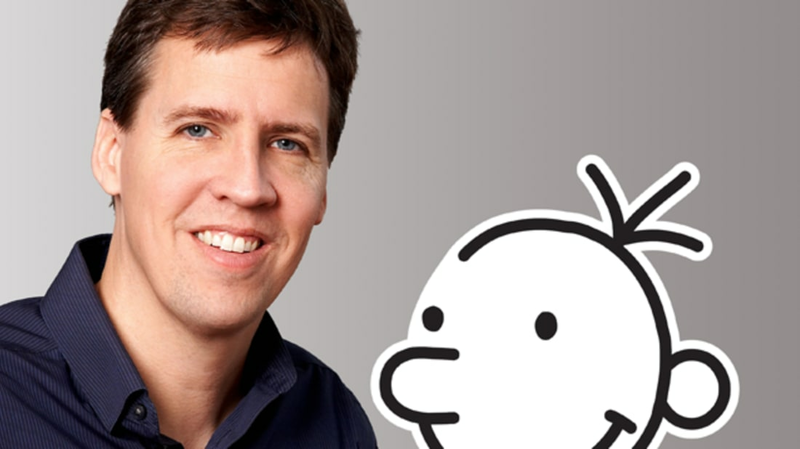 This month, Jeff Kinney releases The Long Haul, the ninth book in his Diary of a Wimpy Kid series. "It's a classic road trip story where Greg Heffley and his family head out on the open road and then everything turns sour and then there’s sort of a descent into hell," he says. "I’m actually really excited about it, because I think it’s the best one by a mile." We talked to the author and illustrator about his writing process, where he finds his inspiration, and the key to penning a good book. Some of your childhood experiences inspired the Diary of a Wimpy Kid books. Is that the case in this book? Do you have a crazy road trip with your family that you were drawing from? I long ago tapped out my own childhood experience. There’s very little of what I went through in this book. I was writing it with a movie in mind—this is the first book that I’ve written in three acts and with cinematic set pieces. So I really had a different hat on when I was writing this book. I’ve always had road trip fantasies, and I’d love to rent an RV, a really souped-up RV, and go cross country with my family. But on the book tour I’ve really gotten to see a lot of the country in busses and I’ve realized that it’s nice to have a driver. I think it’s very impractical—it’s not very likely that I’ll end up on a road trip with my family with me in the driver's seat. What is it like to see your work taken and put up on the big screen? How much of a say do you have in how that translates? It’s really exciting and unnerving at the same time to have your work adapted. I was an executive producer on all three films, and I worked with the producers and the writers on the story from the beginning in each film. I was on set for about half the time and helped with casting and marketing and merchandising. It’s really probably as involved as an author can be. My real aspiration, now, is to screenwrite as well, because I think it’ll be really exciting to be in that seat and to work with film as much as possible. In Hollywood, as an author especially, you really need to figure out where you fit in. The movie business has been around for a long time, and all the roles are really clearly defined. There’s not a role for the author, and it’s for good reason. I think it’s because authors can be really precious about their work, and I’ve really had to try to figure out a way to fit in and to have some influence over the films while accepting that I don’t really have control over the outcome. Can you talk a little bit about your writing process? What comes first, the story or the illustrations? Actually, I do everything upside down. What I do is I spend about six months just writing jokes, and they’re disassociated with everything—they’re not even connected to one another. So what I do is come up with a pile of jokes. I find that 350 is my ideal number. And then what I do is I look at the jokes and see if there’s a theme, and then I start working on the theme, and then I try to string the jokes together into a plot. So I really put a priority on humor in the books and not on plot, because I’m really trying to get maybe two laughs a page. If I wrote it the other way around, where I wrote a narrative or started with a theme, then I’d be trying to inject humor into it, and I don’t think the books would be as good. And when do the illustrations come into play? In a flurry at the very end. I usually do my illustrations over one month and it takes about 350 to 400 hours to draw them. It makes for some very late nights. I think my schedule this August was to draw until about 4:00 in the morning and then go get back at it at 9:30. I usually give my summers over to the books. Some writers have methods for making them more productive—Agatha Christie liked to brainstorm ideas in her bathtub, and Stephen King sets a goal for a number of words he likes to hit per day, and he'll just write until he hits it. Given that you've written an incredible amount in a short period of time, what are your secrets to productivity? I don’t have any secrets. I wish there were something that I could do consistently that would generate jokes, but there are many nights when I’ll lie down on the couch, put a blanket over my head, and sit there for four hours and not come up with a single joke. This was the first year, actually, that I went away for a few days by myself to write, and I ended up being really productive. I was really surprised and happy to see that I’d come up with my best material during that five-day stretch. I’ve tried to just start writing, but that doesn’t work with me at all. It just feels like I’m writing poorly, so it doesn’t feel like a very fruitful exercise. Everything, for me, is dependent on the jokes. The quality of the jokes is what’s going to dictate how good the books are going to be. So I just need to figure out a way—I wish it was long walks or spells in the hammock or something like that, but I need to figure out how to produce more in a shorter amount of time. Do your kids ever inspire any jokes or plot points? Yeah. There are times when I get ideas directly from my kids. For example, one of my sons was in a changing booth with my wife when he was much younger, in preschool, and he decided to run away as a joke. So he ran out into the main pool area with no clothes on, and that’s made it into the new book. There are sometimes things that kids do or say that I can use, so it’s always fun to let those things into the books. What having kids has done for me is it’s given me a second look at childhood. As I mentioned before, I’ve really tapped out my own experiences and now I’m able to see it all over again, and of course from a different vantage point. I remember one day my older son came home—he was in preschool at the time—and he told me about Tattle Turtle, which was a doll that they had in their preschool classroom. The idea behind the Tattle Turtle was that if one of the other kids did something that was worth telling the teacher about, then it was just as worth telling the Tattle Turtle. So you had these kids reporting each other to the Tattle Turtle. I thought that was great, so I ended up putting that one in my books. School itself must be so different these days than it was when you were in school. Certainly, having kids helps, but is that ever an issue for you when you're writing? And technology has changed so much, too. Things like iPads are being used in classrooms now, and that has to have an impact when you're trying to create something that's going to feel timeless. Right, right. That’s been one of the most difficult things for me, is trying to make the books timeless but also keeping up with the modern changes in technology, and especially as it relates to the social component. When I write the books, I have a general rule, which is that I try to make the books so that they could have happened 20 years ago and that they could happen 20 years from now. It’s hard to see where technology fits in, but one thing I know is that, 20 years from now, people will still be trying to determine what’s the proper age for a kid to have a cellphone. Maybe it will get younger and younger, and maybe one day it’ll be preschool, but now I think there’s that nebulous area between, say, 9 and 12. So I can write about Greg getting a cellphone because I think that will remain something that is a hot topic going into the future. Is it true that didn’t start off writing the Wimpy Kid books for kids? Yeah, that’s true. Growing up, my father introduced me to comics, and he had a drawer of old Donald Duck and Uncle Scrooge comics that were always available to me throughout my childhood. And he also liked to read the comics in the newspaper and the Washington Post. So every morning I would go downstairs and the newspaper would be open to the comics page. That was a part of our interaction and communion, and so when I got older and went through college, I actually decided to create a comic strip of my own, which ran in our college paper. After that, I tried for several years to get syndicated—didn’t have any success. So, I decided to put my comics into a book. And so in the eight years that I was working on Diary of a Wimpy Kid, the whole time I was thinking of an adult audience, because that was my preference for comics readers. So I was really surprised when I presented my book to a publisher, that my publisher said that what I’d done was written a children’s series. That was really unexpected and caused me a lot of dissonance, because I hadn’t considered a kids audience at all. Now, looking back, that seems foolish. I can’t believe I had the blinders on like that, but that’s the way I created the first draft of Diary of a Wimpy Kid, which is about 1300 pages. Did that change how you approached the next book? It didn’t change the way that I approach the writing; in fact, I still write for adults and I write with the idea that maybe my brother or my father will read what I’m writing. Every so often, I’ll come up with a joke that isn’t as good or maybe is a little bit broad, and I’ll think, “Hey, that’s not up to my standards,” but then I’ll think, “Maybe kids will like it.” That’s when I always pull back. That’s where my line in the sand is. I figure if I keep thinking that way and start writing for kids, that the quality will erode and self-destruct. I keep my eye on that line. It’s interesting watching or observing my kids watch television. The first stage is that they’ll watch shows with a really heavy and obvious moral message, like Barney, and other shows of that ilk. And then the kids leapfrog very, very quickly to something that’s a lot more edgy. I think it’s because kids can sniff out moralizing. So I really try not to do it in my books. In fact, I try to avoid happy or neat endings; I’d rather leave the reader with a feeling of dissonance at the end, because I feel that’s where humor can be gotten. It might be hard to think about this because you’re focusing on this current book, but do you have any sense of what the future holds for Wimpy Kid or how long you’re going to keep going? I think there’s about to be a really interesting and fun resurgence of the Wimpy Kid universe. I’ll start working on the tenth book almost immediately, and hopefully I’ll be able to create a book of comics next year or the year after as well. And then I’m working on two televised holiday specials, and we’ve just started talking about a new feature film. I think there’s a chance that the whole thing could be reborn, and I think that’d be really energizing.